“It never rains in Southern California … it pours, man it pours,“ goes the 1972 hit song (when the Congressional Cup was already seven years old). And today in Long Beach, it poured. A rare storm system swamped the race course on Day Two of the 51st annual Congressional Cup regatta, the opening World Championship event of the 2015/16 World Match Racing Tour. PRO Randy Smith’s Race Committee were able to complete just two flights, in westerly breezes from six to nine knots, before the rain arrived. It swallowed up the container ships anchored in the distance, then obliterated the course in a white-out forcing a postponement to the racing. When they resumed, the wind had shifted dramatically to the right. A light breeze from the northwest diminished until spinnakers were drooping, finally becalming the fleet in the lee of the storm. Three flights of Qualifying in total were completed: and the racing was as turbulent as the weather. An otherwise on-fire Chris Steele NZL (36 Below Racing) rounded the wrong top mark, and handed that race to Joachim Aschenbrenner DEN. Switzerland’s Eric Monnin (Team SailBox) edged out World Champion Ian Williams GBR (GAC Pindar) in a tight contest. Congressional Cup defending champion Taylor Canfield ISV (US One) uncharacteristically mistimed a start, and bowed to Przemyslaw ‘Tara’ Tarnacki POL (Energy Yacht Racing Team). Said Tarnacki, "We are happy with the two points we got today; the first one we’ve won against Taylor Canfield," he revealed. "It’s good to have a win, after yesterday," – when the Polish team was 0-6. "I wasn’t devastated, but a win is good for your head; it takes the edge off." Returning to the Congressional Cup after an eight-year hiatus, he said the team was determined to "keep learning, and push very hard." Tied for second overall, Phil Robertson NZL (Waka Racing) finished another solid day, saying, "I’m actually quite surprised how well we’re doing! I’ve come second-to-last here [Congressional Cup] twice, and the boys are joking that we’ve won more races in the first day, than we’ve won in the last two regattas put together! We’ve outdone our expectations already." Robertson attributed his pace to that fact that he’s having "a lot of fun" – something that was quite evident at Wednesday night’s press conference, where he celebrated his 29th birthday in a get-up evoking the love-child of PeeWee Herman and Hello Kitty. "That’s a big part of it, you have to enjoy yourself," he laughed. 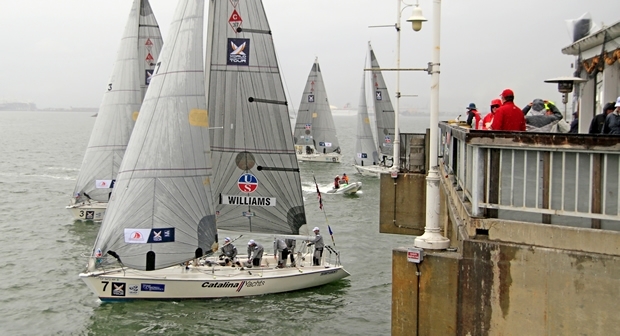 The Congressional Cup is hosted by Long Beach Yacht Club, with racing held off the Belmont Veterans Memorial Pier. The pier offers superior viewing, with tented seating, vendors and live commentary. Races begin each day around 1130 PDT; The Race Management team, lead by Randy Smith, expects to finish the Qualifying double round robin on Saturday and advance to the semi-finals and finals, concluding on Sunday 17th May.